Yes! 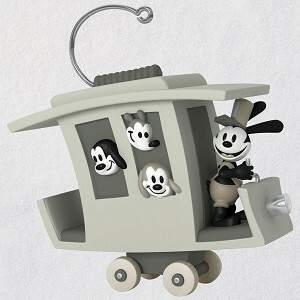 I'm getting a Hallmark Oswald ornament! First, I love Oswald and this is a great item, taken right from one of his shorts. It also reminds me of Steamboat Willie by using the B&W. Second, this will be great in my Magic Kingdom Christmas parade that I put together late in the season last year. But! You have to be a member of the Keepsake Ornament Club which is $50. So the $20 ornament would cost me $70 total. Then a lot of people on eBay started selling them around the same price and higher. No one I knew belonged to the KOC, so it looked like I wasn't getting one. Then last night, I got one for $25! Yes, I'm also paying for $32. When I faced $70 -- I never thought I'd get it for anything less than $40! I'd started saving up so I had the price plus extra set aside. OK, yeah, when I think of what I'm spending... but let's not go there. I'm getting I'll get a lot of use of and really like. I'll had Christmas elements to it to fit in the parade; it's going to be good.